I’ve had a love-hate relationship with Field Notes notebooks for a long time now. Field Notes are those infamous 3.5″ x 5.5″ pocket-sized notebooks in fun editions and colors. But … Field Notes paper is NOTORIOUSLY crappy for fountain pens. So I’ve been searching for a fountain pen friendly version of Field Notes, the same size, but with paper that doesn’t make me want to throw the notebook across the room. So in my research had heard about the legendary Tomoe River Paper, and wondered if they came in notebooks this size. 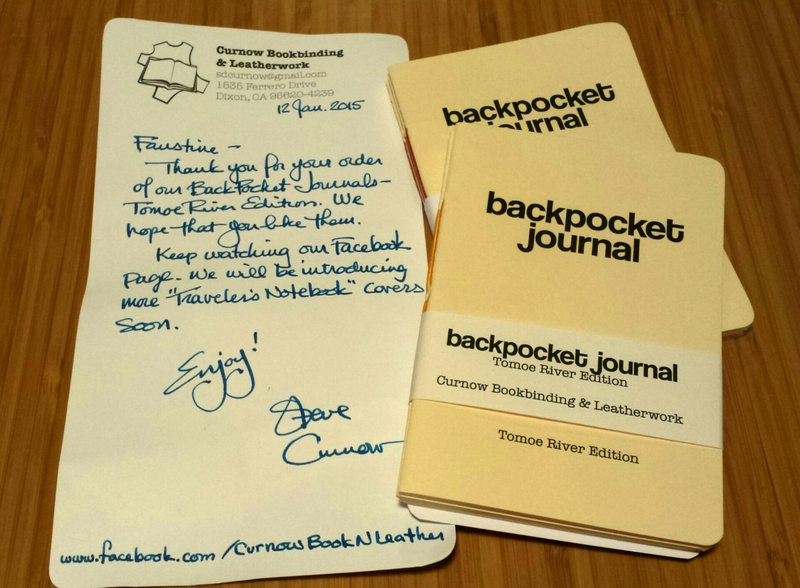 Somehow I stumbled upon this fantastic review from Modern Stationer, and learned all about Curnow Bookbinding’s ‘Backpocket Journals’. 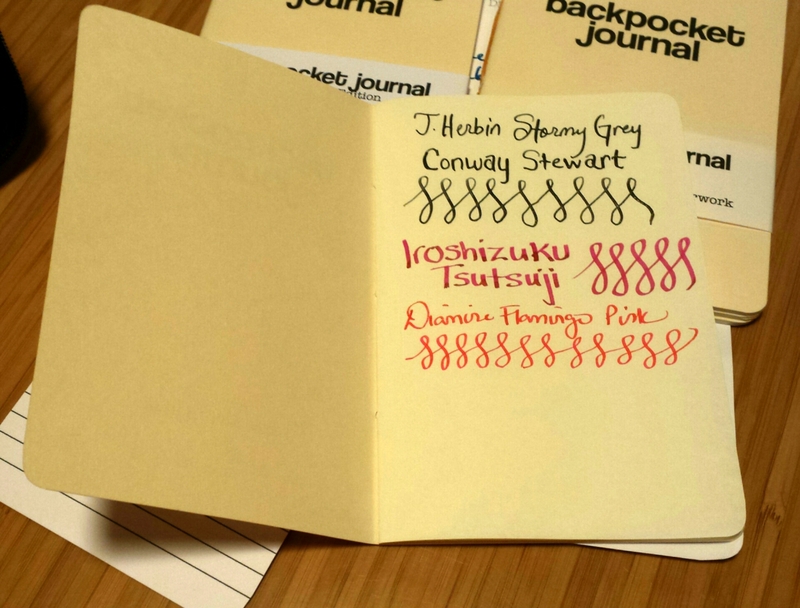 They make “Tomoe River Paper Editions” with the much-acclaimed fountain-pen friendly paper. To order, you FB message or email them, and then pay via PayPal. My order just arrived tonight, WOOHOO! The package was a simple plastic envelope with the little notebooks, a handwritten note, and a carbon copy of an invoice (the accountant in me had to go OMG HOW CUTE IS THAT! ), just a bit. I was surprised to see they were a cream color. It didn’t even occur to me that they’d come in a cream, I just assumed white, so I didn’t think to ask. Given the choice, I would have picked white of course. But oh well, I didn’t specify! Lesson learned for my next order. 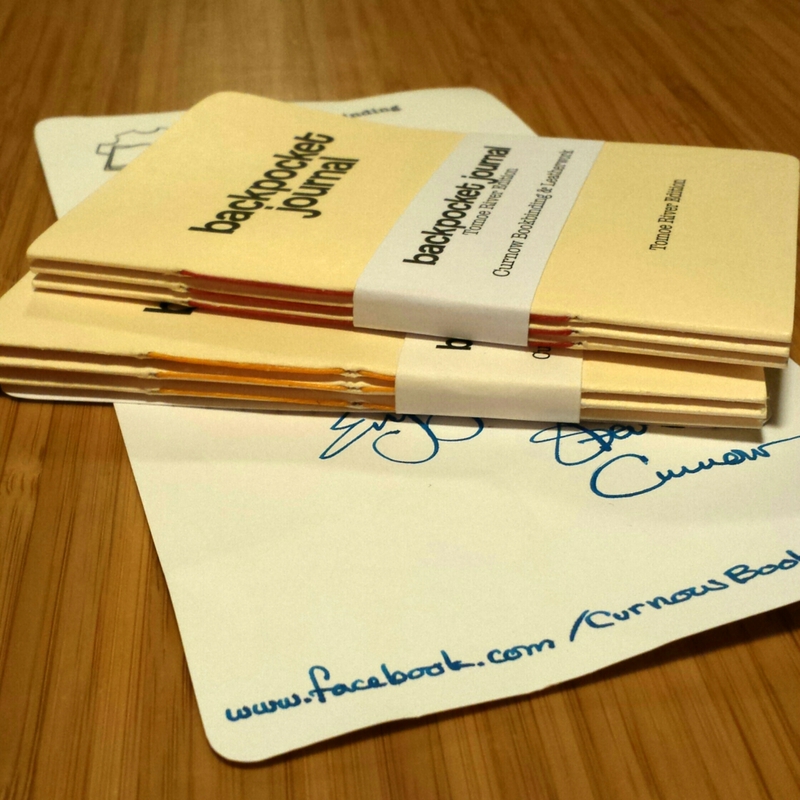 I Facebook messaged Curnow Bookbinding, who were wonderfully nice and helpful. They said they had some white paper to experiment with, and in the future if I wanted to place a custom order with white paper to just let them know ahead of time (to make sure the white paper is in stock) and that’d be easy to switch out the paper at no extra charge. So yay, white paper next time! 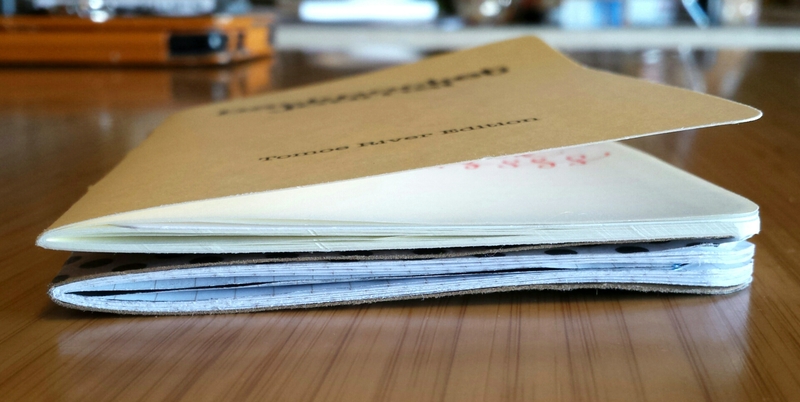 The notebooks are hand-sewn and not stapled like Field Notes. Look at the cute thread colors! The stitching is glued down in the middle of the notebooks. 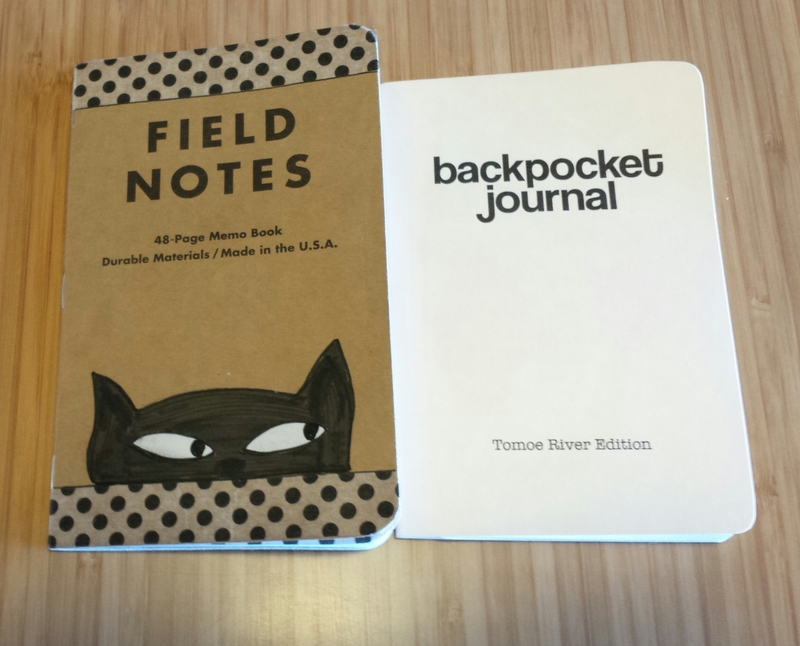 The Backpocket Journals at 3.5 x 5.25″ are the same width as the Field Notes notebooks, but about a 1/4″ shorter. Field Notes are 3.5 x 5.5″. It’s not a huge difference, but they do look a little smaller when next to each other. 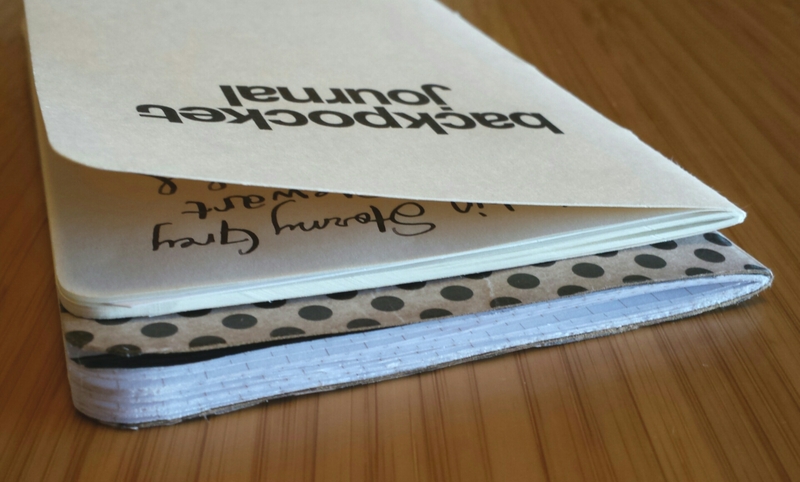 The Backpocket Journals look a little skinnier in profile too – but remember how crazy thin Tomoe River Paper is – it’s practically like tracing paper! So it would take up less bulk in a notebook. The shorter, slender Field Notes alternative my fountain pens LOVE. It definitely feels and looks like a different kind of notebook. 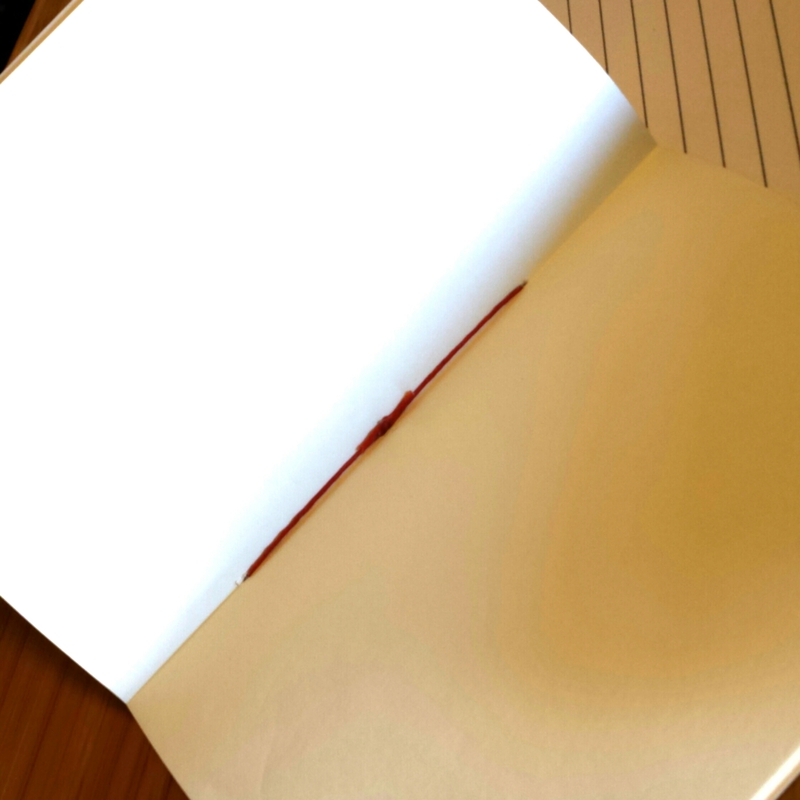 The pages only come blank so far, which is perfect for me as I’m not entirely sure what I want to do with them yet. And included is a handy ruled guide that shows up easily when placed underneath the pages to help with the whole ‘writing in a straight line’ thing (which I cannot seem to do to save my life. Seriously). So yay for that! I ordered two 3-packs, and only received the one ruled guide – I’m not sure if its one per order or just an oversight. Another question for later! 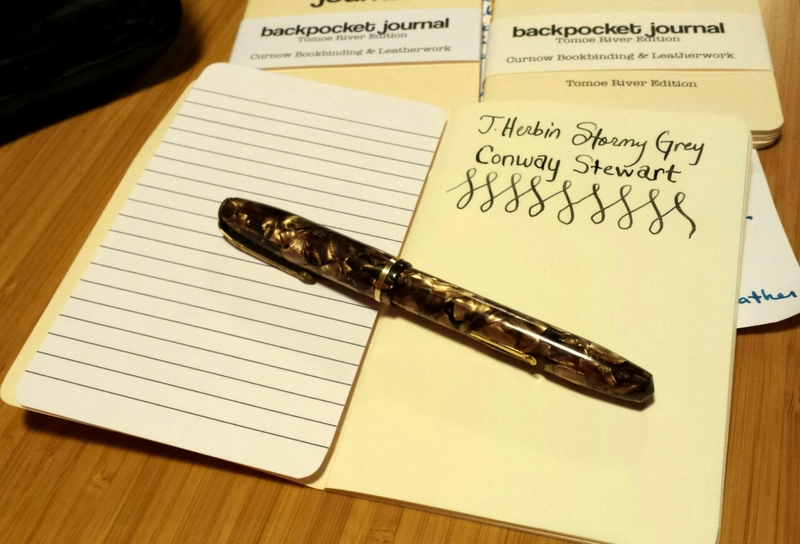 I immediately got out my pens and wrote on the first page with the vintage Conway Stewart flex inked with J. Herbin Stormy Grey ink. I definitely had to wait a few seconds to let it dry – the flex nib is so wet, it sat there on the surface for a good minute before drying (in my non-timed estimation, it seemed like a while anyways). So warning! Smearing might be an issue with you lefties or impatient folks. And this flex nib lays down a very wet line too – it dried a lot quicker with my Lamy Fines and Pilot Mediums. But the BEST PART – as with my one other experience with Tomoe River Paper – there is no bleeding, feathering, major showthrough – it handles the ink wonderfully. just what I wanted. Now to add some extra ink tests! 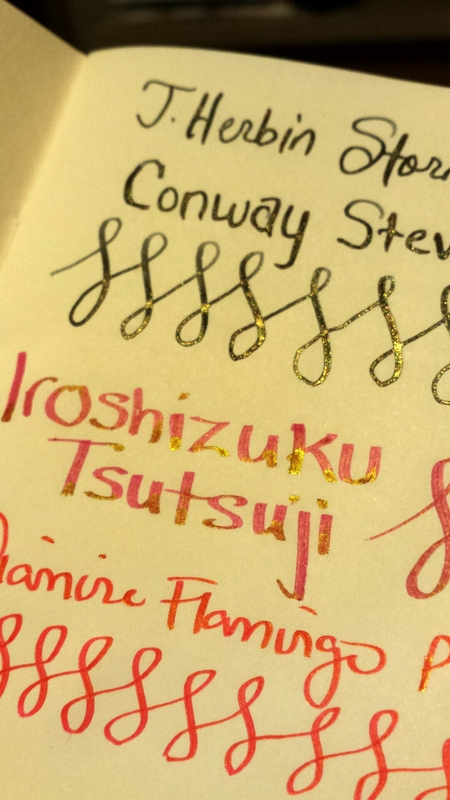 And HOLY CANNOLI it shows the gold flakes and sheen AMAZINGLY well. I can’t stop tilting the notebook under the crappy yellow lighting in my kitchen hahaha. All in all, I’m really excited to try these out. I’m not 100% thrilled they’re cream, but I can live with it and it’s certainly no deal-breaker. I highly recommend these notebooks. My next step is to figure out how to insert them into my new Midori-style cover! All content, text and photos in this blog are copyright of the author and may not be used or reproduced without express permission. All downloadable templates are for individual use only and may not be resold or distributed in other ways. New Undated Weekly/Daily Prototypes in New Sizes! Coming Soon: Midori/Hobonichi Style in Junior size!